We're hiring - join the Garage48 family! 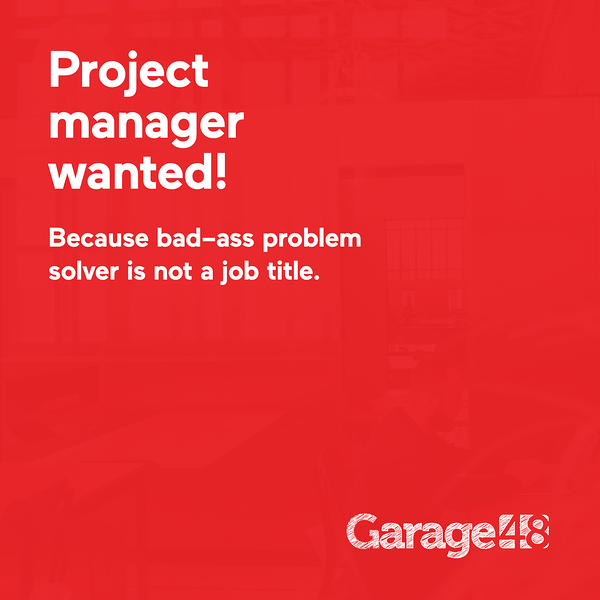 Garage48 is looking for a full-time project manager! Garage48 event series was started in 2010 by 6 successful Estonian startup founders as a way to bring the Silicon Valley attitude to this side of the world. Today Garage48 and our Tallinn based co-working space LIFT99 are among the central organisations of the Estonian startup scene. Our goal at Garage48 is to organise hackathon events that boost local startup ecosystems all over Eastern and Central Europe, Africa and Asia, to help to build communities and to promote the entrepreneurial mindset. As a Project Manager, you will be working alongside our amazing team. Your main responsibilities will be taking the lead in event organisation and also focusing on the communication related to Garage48 brand and the overall message. Have you always been wow’ed by startups and innovative ideas? Are you flexible, eager to learn, into tech and have got what it takes to conquer the world? This job is for you! 1. (Not yet discovered) passion for tech and start-ups! We Are Hiring: Join Garage48's Family!